Looking for a new gender reveal idea? How about lasagna? 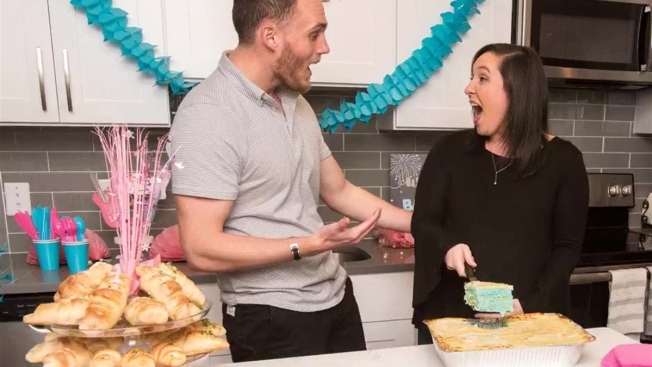 Not to be outdone by rumored alien invasions, an Italian chain headquartered in New Jersey is adding another offering to the gender reveal party repertoire: lasagna. Available now, the Gender Reveal Lasagna Catering Package (yes) features one cheese lasagna with a secret pink or blue interior, a tray of Villa Italian Kitchen’s famed garlic rolls and a choice of either a garden, Caesar or Greek salad for just $139.99. According to a press release issued Monday, "Each lasagna is made-to-order from pasta imported from Italy, a classic Italian Alfredo sauce, creamy ricotta cheese and melty mozzarella, making the gender reveal experience a delicious memory for new parents to cherish forever ... The Gender Reveal Lasagna is sure to be the talk of any party – once the new parents cut into the lasagna and reveal either pink or blue dyed cheese, everyone in attendance can celebrate the family’s new addition with a hearty meal!" The party package serves 12. Anyone interested can visit villaitaliankitchen.com/catering to learn how to place an order.